Normally, I am pretty verbose; spoken or written, I like words. My grandmother used to call me a chiacchierone...it means chatterbox. Apparently, I started speaking in full sentences at eighteen months or so and I haven't come up for air since! However, today, I have decided to let my photos do the majority of the talking, as I feature part of my backyard. We started with a blank canvas and added almost everything, pool, pond, patios and, like everywhere else in our home, the décor choices were deliberate and the area is filled with accessories we cherish. Our goal was to create a look where the new additions fit, as if they could've been part of the cottage landscape forever. We also wanted a garden that would amazing every year, without a lot of work. We opted for a lot of perennials, a very few annuals in pots for pop and lots of discount seed packets! Overall we are very pleased, we love it and use it every singe day! Let's walk, shall we? We love perennials, we split them and transplant them each fall to fill in more of the yard. 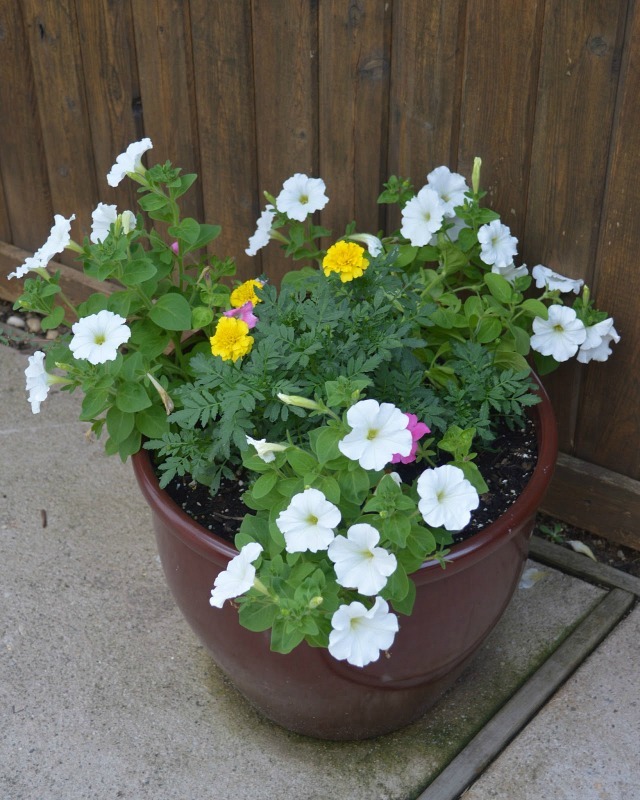 We bought a few plants at a deep discount sales and have been splitting them every since. These pretty mosaic pots were a gift from my mother-in-law. 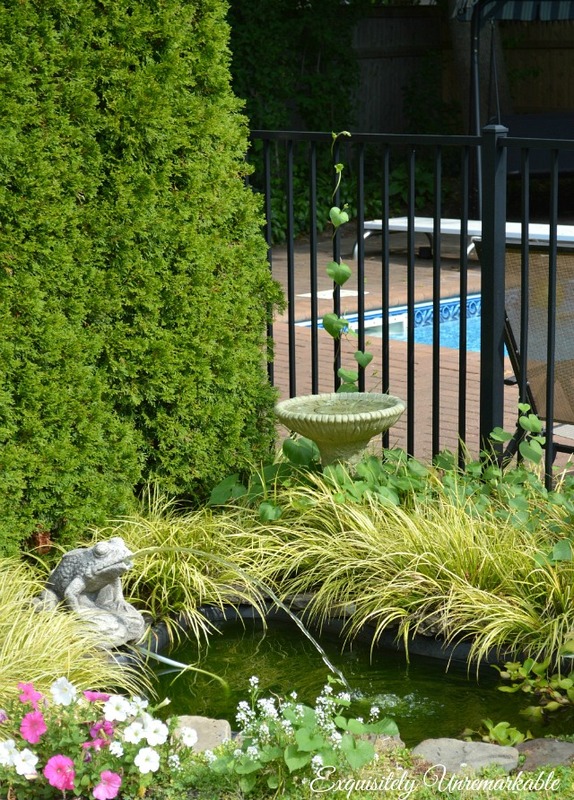 My handy husband installed this pond (a Kmart special) and made the frog fountain out of an old cement yard ornament from his grandmother's house. It is the most treasured piece in our yard as it reminds us of her and a holds so many nice memories for my husband. We adore the pond, we have an actual bullfrog in residence and there's nothing more relaxing than the sound of running water! Solar panels on the garage heat the pool water very efficiently and it's free! This is the one and only bloom on my hydrangea this year...it's one more than I got last year! 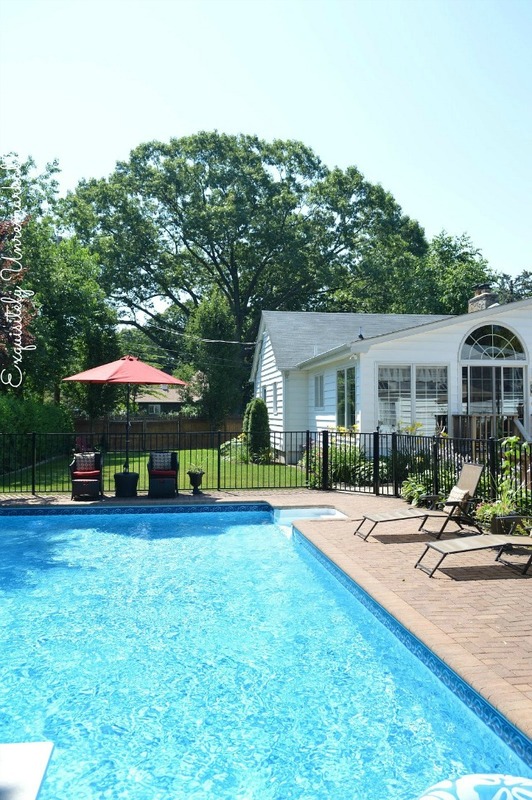 Our cute little pool house is ripe with possibility! I really need to get busy before the season is over! I love hostas! We have some in our yard that came from my favorite aunt's house in Connecticut. My mom brought them home and I took some when we moved. 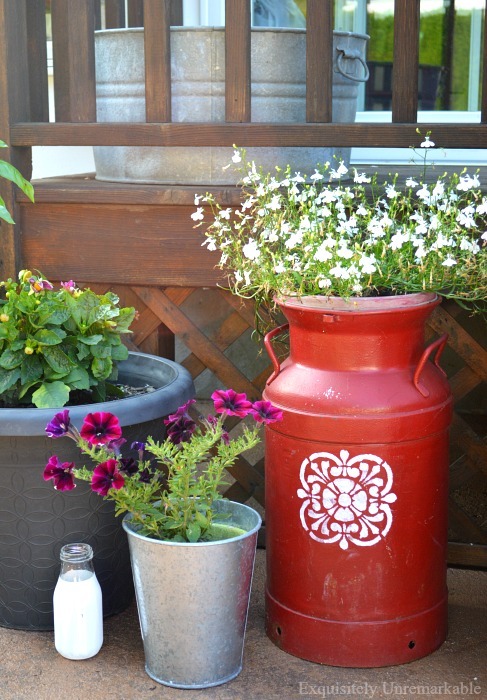 It's another sentimental touch in our garden! Best place for a nap. Ever. 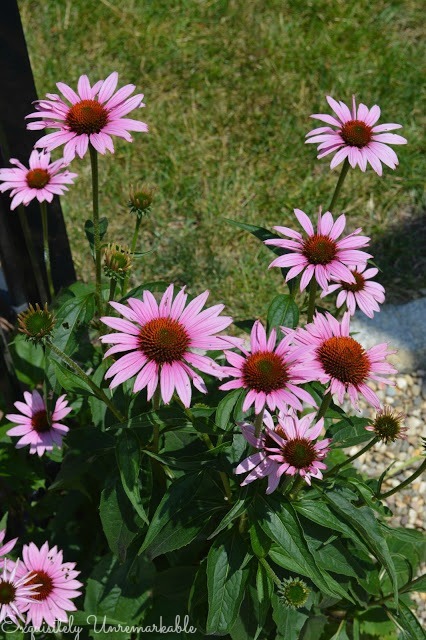 The coneflower was given to me by a student years ago, we have since split it and peppered it around the yard. The frog was 60% off at Michael's this year...no sentiment, but he doesn't need it, he's just adorable! Like everywhere else in this cottage, space is an issue. These chairs are great since the ottomans tuck neatly away and do not take up too much of the path. We also clipped the umbrella to the fence with a stainless steel U-bolt, so we do not need a stand. Every year, my husband strings up the garage wall, drops a handful of morning glory seeds and by August we have a wall to wall flowers. We chose a concrete patio with wood forms, because we wanted an old world look. It works very well, but it does need to be stained again, the brown tone has faded. The updated look is much prettier. I hope you have enjoyed your tour! Wait! There's so much more!! Check out our DIY screened in, covered porch. Yes I did! Truly you have a marvelous place to relax and unwind, thanks for sharing it Kim! I have to say that we do love it and it is a great place to relax! Thanks for stopping by, Vel! C'mon over, Marty~ I love guests! What a wonderful yard! I love all of it, especially the pond! I'm a new follower. Thanks Kathy! I love that pond, too...and its tiny inhabitants! Lovely cottage and garden! Looks so homey and colorful! 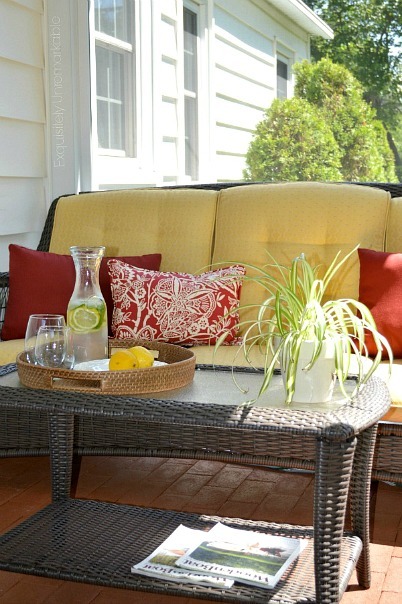 LOVE that red umbrella and patio set too! Not sure 'unremarkable' quite fits your garden - it's stunning :) Clever thinking with the solar panelled heating for the pool. Thanks so much! We do love that solar heater...it makes a huge difference! I would say that your cottage yard is "exquisitely remarkable". Enjoy the remainder of summer. You've created a little paradise...ENJOY! Love your yard! I really love that red & brown patio set too. Gorgeous plants and a pretty spot to enjoy them - sheer bliss! Everything looks just perfect. Love your home and the pool is just fabulous. chatterbox, that's funny. loving the solar panels, and you seem to have way better luck with plants than me, unfortunately! Your yard is so pretty, and I love your pool! We are gardening soul mates, I think. I have all the same flowers in my garden. Do you cut your hydrangea back each year? If so, this could be why it doesn't bloom. Love your blog! Thank you, Poppy! I love your taste, so I hold your words in very high regard!! It's so funny, that morning glory just takes off every year...a .69 cent packet of seeds is the most prolific grower in the garden! What a pretty yard and pool area! Love your hydrangea. That's still one more than I have. :) I'd love to have them, but it's too hot here. Great tour! Thanks Lisa! I cannot imagine the heat in Texas, but at least you have an excuse! I think I'm just a lousy gardener when it comes to hydrangeas! Thank goodness for the silk ones at Michael's!! I love the chairs with the ottomans that are under the umbrella. I want a pair of those so bad. You did a great job with all the outdoor space. I really like how you used the space -- particularly with the chairs where the ottomans slip underneath and clipping the umbrella to the iron fence. Great ideas! Thanks Jennifer! A small house and yard demand creative uses of space! Your backyard looks so inviting! You did an awesome job in laying it out! Love the pond and the memories it holds! What a retreat you have in your backyard. :) Love all the thriving flowers. Thanks for the tour of your cottage garden and pretty backyard space. Looks like a great place to hang out for the summer! Very pretty Kim! Thanks for coming by via the Pinterest party. What a great yard! What a great outdoor space! That pond is just so cute! Wow, beautiful backyard you have there, Kim. Ahhh a great place to unwind. Thanks for stopping by at my blog and for the sweet comment.See you around. I do love the solar heater, but we cannot control the temperature the way you can with a gas heater. Our pool is in the sun all day long, so it gets pretty warm to begin with, the solar panels just top it off, but when it is cloudy or rainy for a few days, it cools down for sure and there's no way to turn it up! Your yard is beautiful and so well organized and kept. I'd love to sit by your pool and enjoy it all. Lovely! Thanks Laurel! I can't take all the credit, I have a very handy and helpful hubby! What a wonderful tour! Your flowers are just lovely. I bet the morning glory is amazing in full bloom. I especially love the personal, sentimental touches. You must love sitting outside taking it all in, but a nap sounds pretty good too! I LOVE your garden! Everything looks so pretty and vibrant. Gorgeous! Thank you, Natasha! Too bad summer is such a short season in my neck of the woods! I love your yard. Your pool, your pond, all your flowers- gorgeous. I bet you and your family enjoy spending a lot of time outdoors. So gorgeous and beautiful! You guys have created a wonderful oasis!! Sorry, I'm still crying over your dad and the Carnation Milk Meat Loaf! You’re so funny! I didn’t mean to make you cry. We do love the backyard. The kids love to hang out with friends, close to home, which makes it all worth it! Kim, I always love little peeks of your yard and gardens. It just really impresses me how deliberate you and your husband are about things. You're smart and you have the ability to make things pretty. Thanks Stacey! What a lovely comment. I really appreciate it. We do work hard at creating what we love, but we love the process, so it’s not really work!! Oh goodness, I sure did enjoy my tour and now I am ready to stay! I so enjoyed hearing about the history and stories of many of your plants, they are all thriving and I can tell you are a true gardener. Great to have you join the garden party, it has been so much fun! Each area you shared in your garden is perfectly you- great design, creative ideas, and a sense of home and comfort. Kim, what an oasis you have created. I love perennials as well. Buy a few and before you know it, you have a lot. I too love the sound of running water. It is so soothing in the garden. Thanks for sharing with the Garden Party. The sounds of running water is my favorite, Jann! Thanks for the visit! Your garden is lovely and I like what I saw in the quick peek at the house. Like you I had no hydrangea blooms last year, but things are looking better this year. Kim your pond is just spectacular. Thank you so much for linking up to the Garden Party. Your post was completely enchanting!